Alderman Mrs E. Smith J.P. Will open the Gymkhana at 3.15 p.m. Judges: (Sports Events): Lieut-Col H.H.J. Gould, Major J. Falconer, Captain G.P.L Powell. Handicappers and Starters: F Mulvihill Esq, W. Fletcher Esq, (Godiva Harriers). Superintendent: Lieut McFarlane, Chief Marshal: Capt F.C. Marshall. Director: C.H. Trimnell Esq, Woodend Riding School, Meriden. Judges: Val Moore Esq, Leicester, J. Young Esq, Leicester, Miss M.R. Tyrer, Leicester. 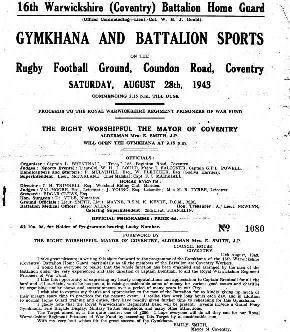 I take great pleasure in writing this short foreword to the programme of the Gymkhana of the 16th Warwickshire (Coventry) Battalion Home Guard, particularly as all the members of the Battalion are Coventry Workers. I would like everyone to realise that the whole function has been organised and arranged by the men of the battalion under the very experienced and able direction of Captain Brentnall, to aid the Royal Warwickshire Regiment prisoners of War Fund. I take this opportunity of expressing my hearty congratulations and appreciation to Captain Brentnall for all the hard and self sacrificing work he has put in, in raising considerable sums of money for various good causes and charities by organising similar shows and entertainments over a period of many years in our City. I wish also to express my thanks and appreciation to the men of the Battalion for so kindly giving up much of their meagre spare time to practices for the present event. I realise they work long hours each day and in addition to normal Home Guard training and duties, they have readily given further time to rehearsing for this Gymkhana. I gladly note that the Royal Warwickshire Regimental Band will be present. Events include the Grand Pony Gymkhana, Fire Brigade Display, Military Tattoo Snapshots, and many other attractions. The target aimed at is the quite modest one of £250. I hope everyone will do all they can for our Royal Warwickshire Regiment Prisoners of War Fund by exceeding this Target by a considerable sum.